The cool weather won’t be around much longer so I took advantage of it recently and made a cast iron skillet chicken pot pie. I loved the idea of making the whole meal using one skillet. 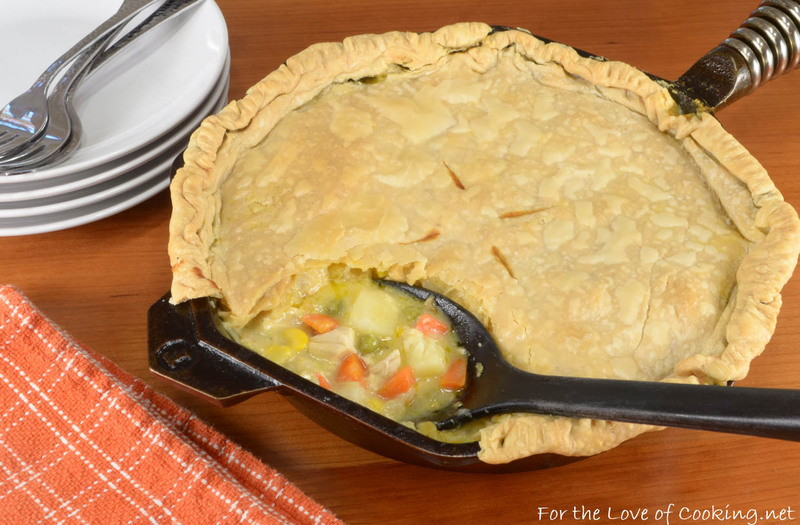 The store bought crust made this pot pie perfect for a busy weeknight and it tasted comforting and delicious. I served this chicken pot pie with a Maple-Roasted Carrot Salad along with some fresh baked bread and my entire family thought it was tasty. Cook the potatoes in boiling water for 10 minutes, or until nearly fork tender. Drain. Heat the butter in a large cast iron skillet over medium heat. Add the onion, carrot, and celery and cook, stirring often, for 3-4 minutes, or until nearly tender. Add the minced garlic and cook, stirring constantly, for 30 seconds. Sprinkle in the flour and cook, stirring often, for 1-2 minutes. Very slowly add the broth then add the milk and cook for a few minutes until a bit thickened. Season with sea salt and freshly cracked pepper, to taste. Add the drained potatoes, chicken, frozen corn, and frozen peas then stir until well combined. Taste and re-season if needed. Place the pie crust on top of the filled cast iron skillet and crimp the edges with a fork. Make a few slits in the top of the pie with a sharp knife for venting. Place into the oven and cook for 45 minutes, or until golden brown. Remove from the oven and allow to cool for 15 minutes before serving. Enjoy! Heat the butter in a large cast iron skillet over medium heat. Add the onion, carrot, and celery and cook, stirring often, for 3-4 minutes, or until nearly tender. Sprinkle in the flour and cook, stirring often, for 1-2 minutes. Very slowly add the broth then add the milk and cook for a few minutes until a bit thickened. 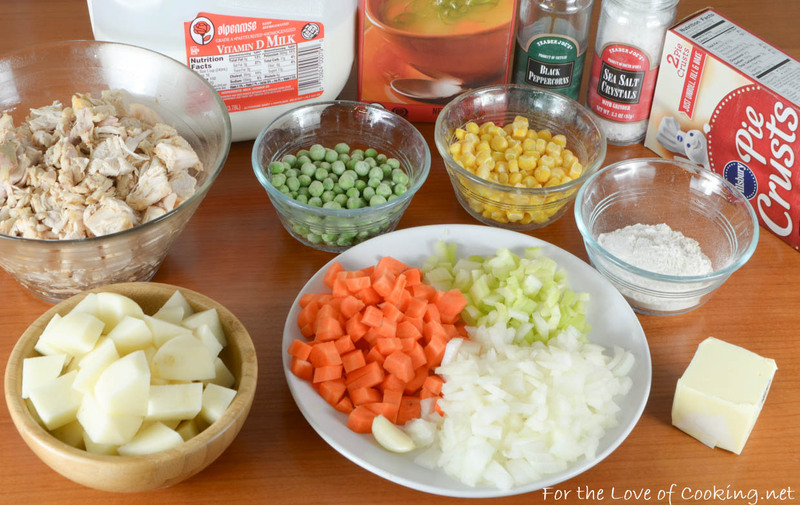 Add the drained potatoes, chicken, frozen corn, and frozen peas then stir until well combined. Taste and re-season if needed. Place the pie crust on top of the filled cast iron skillet and crimp the edges with a fork. Make a few slits in the top of the pie with a sharp knife for venting. Place into the oven and cook for 45 minutes, or until golden brown. Remove from the oven and allow to cool for 15 minutes before serving. Enjoy! Looks perfect for a cool day. I think our night temps in the 40’s last week were probably the last of the cool temps until fall. Love this!! It’s super chilly here in Boston today, so this looks like the perfect meal! 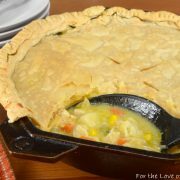 Who can resist Chicken Pot Pie and you recipe looks so delicious. Will have to make this soon. This looks terrific! Anything make in a cast iron skillet is irresistible, don’t you think? And chicken pot pie is always a winner. Good stuff — thanks. That looks super easy! I’ve never had a pot pie with just a top crust; it’s a great idea. I love all things pot pie. I have never actually made one in a cast iron skillet before! Sounds tasty! three cheers for cast iron skillets! 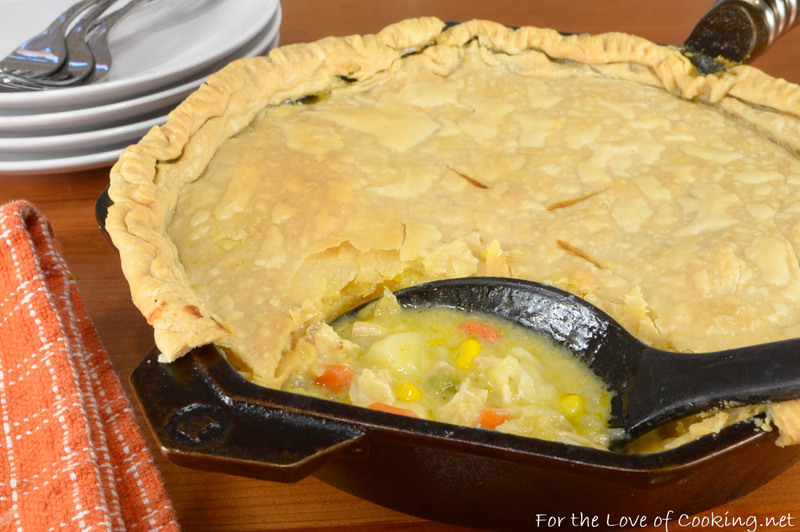 i’ve never made pot pie in mine, but it’s a very great idea! I’m such a sucker for pot pies. Just got my 1st CIS but think I need to fry up a few batches of bacon before trying this in it 🙂 …but soon. 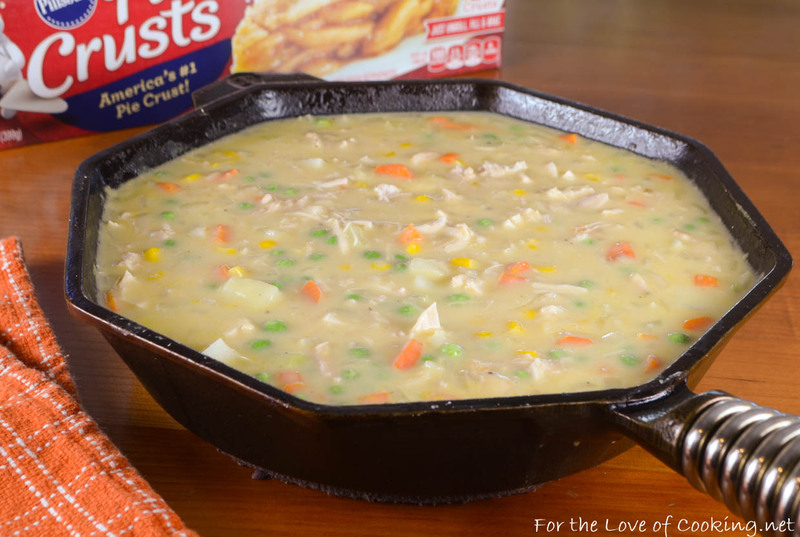 Would love to find a stovetop pot pie recipe so I don’t have to turn the oven on in summer. Must try this before summer hits! Made it and loved it! Will be making another batch tomorrow. Does the chicken have to be cooked beforehand? It says roasted chicken. Yes, it was leftover roasted chicken.